Size: 15.0 x 8.9 inches. 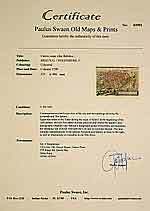 Condition: Some marginal water staining in margins and 3 cm into printed area in the upper part of page. Paper slightly age-toned. Dark impression on large sheet. Else good condition. 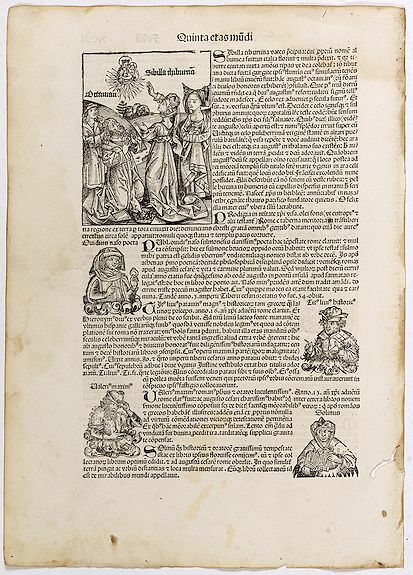 The Latin text page is illustrated with a wonderful woodcut of Tiburtine Sibyl (140x107mm.) telling the legend of the Tiburtine Sibyl (Sibilla Thiburana) and Caesar Augustus (Octavianus). The prophetess holds the center of the stage, and behind her stands a lady, apparently her attendant or maid. The Sibyl has just made the pronouncement and conjured forth for the benefit of the emperor a vision of the Virgin Mary with the Christ-child in her arms, the mother and child being surrounded by a brilliant blaze, in the face of which Augustus (also accompanied by an attendant) has sunk to his knees in an attitude of adoration, and having removed his crown has set it on the ground before him. The miracle occurs in a hilly country and apparently beside a stream, which we may imagine to be the Anio on the left bank of which the city of Tibur was located. Reference: Morse Library Beloit College..